Wilshire Boulevard spans 15.8 miles from Grand Avenue in Downtown L.A. to Ocean Avenue in Santa Monica. 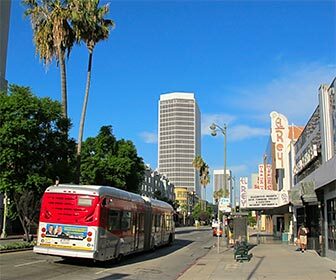 A bus tour of Wilshire Blvd will give you a great view of some nice parts of LA. This is not a formal tour offered by a tour bus company. You simply ride the public transportation on Wilshire Blvd. See also: Wilshire Boulevard Virtual Tour. From LAX, a bus ride takes 30-60 minutes each way (including transfers) to get to the intersection of Wilshire and Sepulveda. This is a self-guided tour, so be sure to download and print information from one of the websites listed above. After you arrive at Wilshire and Sepulveda, the bus tour of Wilshire Blvd will take 3 to 6 hours, or more, depending on your stops and traffic. So this activity will take anywhere from 5 to 8 hours, plus time for stops. Don't forget to allow an additional hour to get through security and walking through the terminal at LAX.